2019 is almost here, and millions of people across the country will ring in the New Year with a drink…or two…or ten. New Year’s Eve is one of the biggest holidays for drinking alcohol, and as a result, New Year’s Day has a lot of people fighting a brutal hangover. 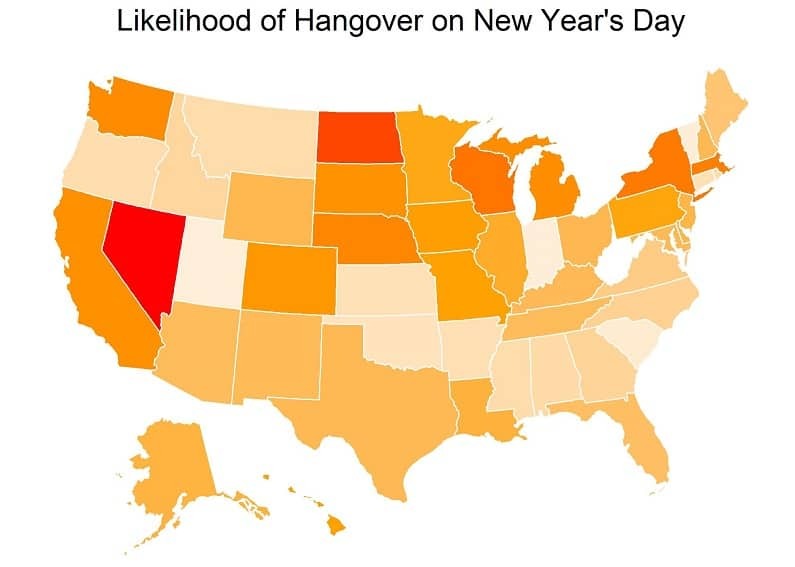 We decided to find out which states in America are most likely to drink a little too much this New Year’s Eve, using data from Google Trends and the United Health Foundation’s America’s Health Rankings report to calculate our 2019 New Year’s Day Hangover Ratings. This shouldn’t come as a major surprise as Las Vegas is one of the world’s best party cities and a great place to overindulge on booze on New Year’s Eve. Good thing Vegas has mobile hangover treatment busses on hand to lend a hand. People from all over the world flock to New York City for its huge New Year’s Eve celebrations, which explains why New York state earned the 4th spot on this list. Fortunately for New Yorkers, the data shows that during the rest of the year, the state is average when it comes to the percentage of the population that drinks excessively, with 21 states having more severe alcohol issues. It might be surprising to see these states toward the top of the list of places most likely to be hungover on New Year’s Day, but unfortunately, numerous data sources, including the previously mentioned report from the United Health Foundation as well as CDC data, indicate North Dakota and Wisconsin have a significantly higher percentage of adults who binge drink than other states. Not surprisingly, these states also have very high incidences of alcohol-related driving deaths, so please be careful if you’re celebrating New Year’s Eve there. A portion of our analysis involved using Google Trends data to determine which states were most often searching for various relevant terms around curing a hangover. Not surprisingly, Google gets flooded with people searching for information on remedying their hangover on January 1st every year. If you’re reading this and are planning on partying hard this New Year’s Eve, we have a few quick tips to help you prevent a hangover. Drink plenty of filtered water throughout the night. Alcohol makes you dehydrated, so drinking plenty of water is essential for reducing the symptoms of dehydration and a hangover. Ideally, you’d have a cup of water for every alcoholic beverage you have. And while you’re at it, leave a glass of water handy on your nightstand to help you stay hydrated when you wake up. Get plenty of sleep. Both before and after a hard night of drinking, it’s important to get plenty of sleep to build up your body’s immunity and to aid in recovery. Don’t smoke. Studies have found that smoking when drinking heavily can significantly increase the risk and intensity of a hangover. Pace yourself. It’s a marathon, not a sprint. Don’t pound drinks too quickly and overdo it. The average person can typically process about one drink per hour, so keep that in mind during your celebration. Happy holidays and Happy New Year to you all! Ring in the New Year safely and hopefully without a hangover. Is Wyoming still considered a state? Because I don’t see us listed on your list. Thanks for catching that. Made an error when transcribing the raw data from my spreadsheet! I guess Wyoming doesn’t need to be on the list. We are professional at partying and know how to avoid a hangover.